This artistic prayer was created using a method of “zentangle”. The idea is to put an image of the person you are praying for in the center (either a picture or drawing). Then surround that person with what you are praying for. In this case, a friend of mine has been having financial problems and her father was recently killed in a hit and run accident. I decided to make this for her as a visual representation of my prayers. 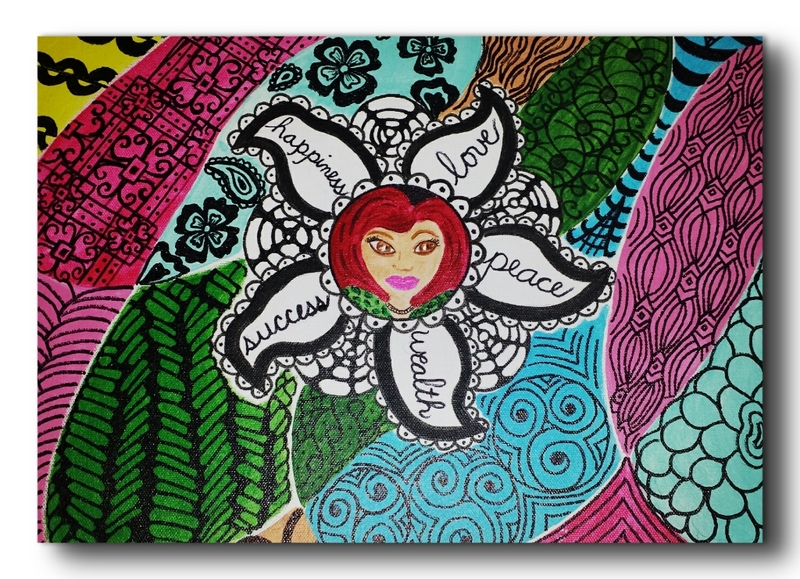 This entry was posted in Creative Showcase (not for sale) and tagged art, colorful, mixed media, spirituality, zen. Bookmark the permalink. That is awesome! I have done zentangle my whole life and didn’t know what it was. What a beautiful way to make art purposeful! Thank you for sharing this. Love and peace! Thank you for your comment! I got the idea from a book called, Yoga for the Brain.